Last year our Nations had some major challenges with Fisheries and Oceans Canada (DFO) with respect to the management of crab and herring. This is nothing new. In our attempts to protect the resources in our territories, our Nations have often gone head-to-head with DFO. We’ve had to. Last year our Nations had some major challenges with Fisheries and Oceans Canada (DFO) with respect to the management of crab and herring. This is nothing new. In our attempts to protect the resources in our territories, our Nations have often gone head-to-head with DFO. We’ve had to. We have lost much of our abalone; we get reports that geoduck, urchin and sea cucumber are in decline; our Food fishers have difficulty catching enough rock cod, salmon and crab. The list goes on. The recurring theme with these declines is that the high-level management by DFO – that cuts our Nations out of a meaningful role in fisheries decision-making – does not work. For our Nations, whose well-being and culture are closely tied to the health of marine ecosystems, we have the most to lose from unsustainable fisheries practices. The over-exploitation of marine resources in our territories, coupled with the lack of trust from the DFO are having real impacts on our ability to sustain our way of life as coastal First Nations. Meaningful change in fisheries management will only be achieved when DFO engages with us in joint decision-making that incorporates our knowledge and respects our Indigenous laws. “We are already being affected by the decline in fisheries and nobody’s listening. 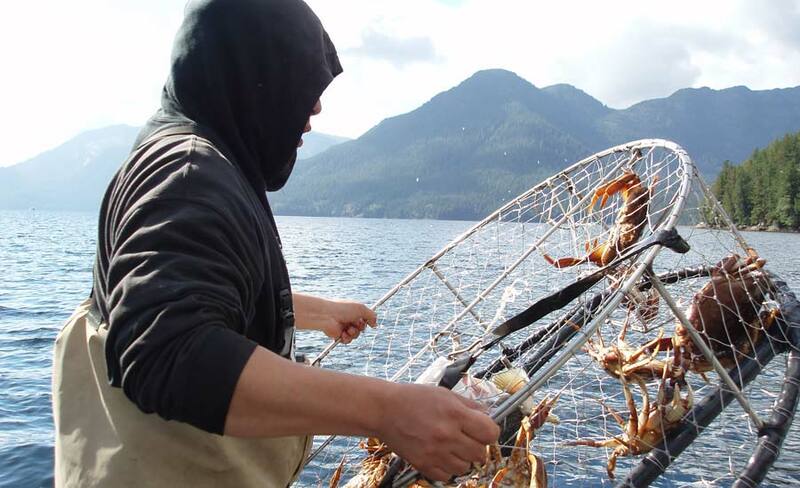 It is really stripping away our future here…Something has got to change.” Heiltsuk Fisheries Manager, Mike Reid. Our Nations have been engaged in discussions with DFO about crab management for eight years. Crab has been identified as a suitable pilot project to create a joint decision-making structure (or government-to-government protocol) for fisheries management. 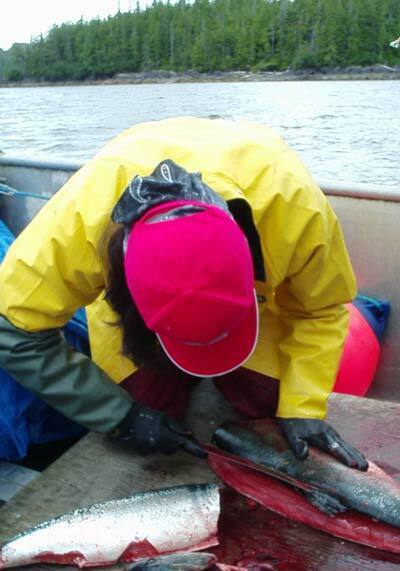 The hope is that a collaborative decision-making protocol for crab can be developed and applied to other fisheries. But, Nuxalk’s Stewardship Director, Megan Moody, says that up until this point, “progress on this work has been really slow. It has been frustrating for our community members and leadership.” Nonetheless, discussions at a recent meeting with DFO showed some new promise, and there is hope that this meeting may mark a turning point in this project. In the meantime our Nations continue to assert our Indigenous laws to protect our resources. But we also remain open to working with other levels of government to find ways to make things work. Megan sits at the Fisheries Reconciliation Table with Coastal First Nations. In her view, “DFO are typically reluctant to give up their management power or let First Nations have too much of a say, even though it would benefit the stocks. As soon as you say the words ‘co-management’ or ‘collaborative ‘or ‘joint’ decision-making, they seem to shy off.” In essence, there is a lack of trust by DFO in our Nations’ management abilities. Reconciliation in fisheries management will only come when DFO engages with us in joint decision-making that incorporates our knowledge and respects our Indigenous laws. “Our fight is not with fishermen. It is with DFO’s managers,” says Mike. “Most of the time when we explain to fishermen that we are closing an area because of conservation concerns, they are on board. They don’t want to see the stocks decline – their living depends on it.” In other words, most fishermen agree that the stocks should be managed better. Mike and Megan’s contention is that First Nations need to be directly involved in making those decisions. Pulling traps during crab surveys. Part of the problem is DFO does not regularly have people on the ground within our territories. This typically means people in offices far away are making decisions about resources with no local knowledge or feedback from us. It also means relationships between DFO officials and our people are fleeting, with little opportunity to foster greater rapport. “DFO really need to sit down with us and figure out this collaborative decision making process like we are proposing with crab. They have to trust that we [First Nations] are crucial to the sustainable management of our resources.” Nuxalk Stewardship Director, Megan Moody. With the combined pressures from commercial and recreational fishing on the central coast today, we need to incorporate the common sense practices of our Nations to manage the fishery. And we need a meaningful process to enable that. And that process must be built on a foundation of trust.